Umbria has an antique and grand tradition in the making of cheeses, and continues today to produce cheese with the milk of sheep's that graze in the natural valleys or mountains of Umbria. Often these products are made in very limited production or are seasonal items, and thus are not easily found, except in small specialty stores, which can guarantee, due to diligent selection, the authenticity and wholesomeness of the products. 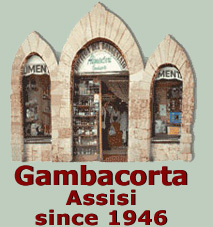 Thanks to dairymen of Umbria and his family's patience and craft, today's gourmets can appreciate the flavor of real pecorino cheese of days gone by. It is then externally treated with olive oil and placed underground amidst layers of straw and juniper, walnut and bay leaves for another 90 days. Incomparable and unique if served in small cubes with acacia honey! 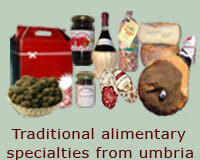 Is a typical Umbrian product made by local small dairies. The wholesome pecorino cheese is made with craft and it boasts a unique, mild yet full bodied and fragrant taste. Makes an excellent antipasto or starter served with pears or grapes. Is a low fat smooth cheese made from cow's milk. It can be eaten on its own or used as an ingredient in gratins, on pizza, on toast, etc. Ideal for picnics. 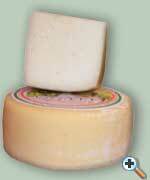 Cheese produced with milk of cow and sheep, soft, sweet, with the addition of many kernels of nuts. Made from the milk of the sheep's that pasture on the mountains of Norcia, seasoned but soft can be used as an appetizer or served at the end of the meal with vinsanto. Sliced on polenta or potato dumplings it is a unique seasoning. Made by the artisans of Umbria, is a unique and excellent cheese that boasts white and black truffles. It is a real delicacy and must be tried! It can be served as a starter or grilled on slices of bread. Finely sliced it is excellent with pasta, rice, egg, carpaccio or bresaola. 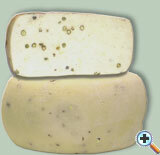 This rare cheese, obtained from the combination of cow and sheep milk, has an unique characteristic. It is how it is aged: set in the special climate of the fields of Norcia, which are very damp due to the nearby springs of the Sorgo River. The mould, the fermentation and the special effects of the milk create a cheese of a consistency somewhat between soft and tender, and hard and dry. It has a taste that is sweet but strong, with an aroma of the herbs of the fields. It is normally left at room temperature. It becomes irresistible when you add a few drops of Sapa wine sauce. It can be accompanied by a sagrantino passito wine. Made of artisan dairymen of Umbria and their family, is the result of a meticulous craft which is typical of the Apennine area around Gubbio. Wholesome and best quality products are used including sheep's milk from sheep's that graze in green pastures and a particular type of chili pepper that produce a hot-spicy and tasty cheese that should be tried. It is excellent as an antipasto or starter, finely sliced and served with any dish or toasted in the oven. The cheese should be keep in the fridge but before serving keep at room temperature for a few minutes. 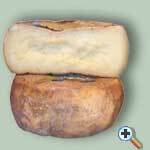 This cheese is born from the tradition to season the cheeses inside small barriques filled with nut's leaf. The cheese, during the permanence in barriques, takes a characteristic perfume of nuts and wine and an unique fragrance. 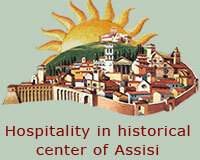 It is delicious with a mustard of pumpkin and ginger or with figs to the juniper and served with sagrantino passito. 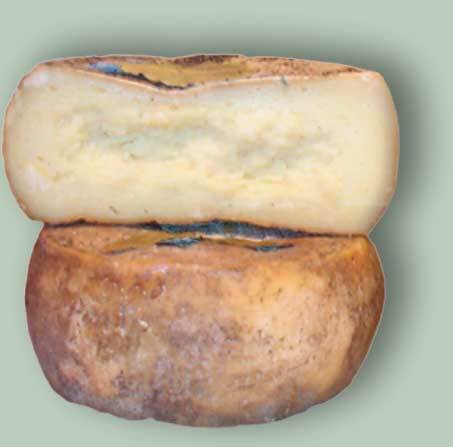 The typical cheese of Umbria, seasoned for 70/90 days in wood barrel and sprayed with wine. Soft and perfumed it is has a delicious taste of marc. This cheese is produced exclusively with milk from goats raised on small Umbrian farms. 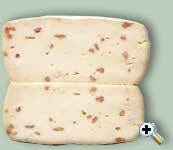 It is available as soft, fresh cheese to be eaten with meals, or a medium-hard cheese used for grating. A cheese infused with black tellicherry peppercorns, this will appeal to those who desire strong and distinct flavors. A wonderful accompaniment is our Mustard of Green Tomatoes (Mostarda di Pomodori Verdi).